How do things in the design world actually get done? All too often the process by which ideas are generated, and by whom, seems to be concealed beneath gloss, ego and design jargon. In Scott Stowell’s first book, Design for People, he sets out to reveal the reality of a busy design studio, which necessarily involves the input of more than just a single genius. The studio in question is Stowell’s own – Open. 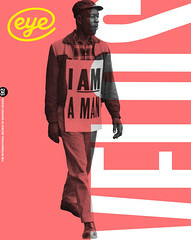 Established by Stowell in New York in 1998 (see Eye 53), Open has worked across mediums as different as print, film, typography, signage, advertising and packaging, and with clients as varied as magazines such as The Nation and Good (see Eye 63), TV shows like Art21 and networks including Trio and Bravo, the Yale University Art Gallery, Brooklyn Bridge Park Development Corporation, Google, Naked Pizza and the National Multiple Sclerosis Society. Yet Design for People is not a book celebrating the work of one studio, or even the author himself. Instead, Stowell tries to provide as full a picture as possible of the mechanics of the design process, an approach that is less about diplomacy or pulling back the curtain on a magic trick, and more about demystifying design and celebrating the act of people working together. His desire for transparency is reflected across twelve chapters, each of which unpicks a different project from the perspective of a variety of voices: commissioners, clients, designers, supporters, as well as people who just happened to drop by that day. These stories are compiled from hundreds of interviews, original correspondence including faxes and emails, sketches and photos; together they provide a rich account of how projects unfold. As Design for People acknowledges, sometimes it is hard to pin down exactly when a design idea took flight. In fact, the role of memory is often revealed as faulty, particularly for those who were on the inside. In her introduction, Karrie Jacobs writes that ‘design is a highly collaborative, inherently messy process, born of meetings, earnest arguments, and goofy offhand remarks. When the design process is working as it should, it’s impossible to sort out who did what’. Stowell is evidently generous to those he works alongside, but he is also generous to the reader. Design for People is a book for everyone, no matter what their pre-existing knowledge of design. It also involves the reader – it feels as if you are being welcomed into a conversation. At times, the variation of voice lends the book a filmic quality, in which the thread of a story is reproduced by talking heads. These ‘heads’ offer the reader an insight into the language used in pitches, the reality of deadlines, the struggles with clients, which battles to fight and how to fight them, and how to get paid for your ideas. It shows that failures can be turned around, and that sometimes practical constraints determine the work – like using an image that is free because the budget does not extend to hiring a photographer – or that sometimes the whole concept for a project can start from an idea formed on someone’s couch, or that sometimes it is just down to what one person likes: in Stowell’s case, chunky sans serif type with bright colours. Letting everyone have their say sometimes results in messy confusion, and Design for People suffers slightly from this. But taken as a whole, the book is refreshing. It paints a richer picture of how design is conceptualised, discussed, argued about, made and remade. And it also shines a light on what happens when you try to get people involved but they decline: the paradox of designing for people. 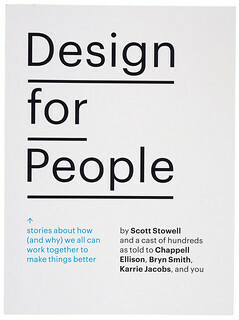 Cover of Design for People designed by Scott Stowell, Martha Kang McGill and Ryan Thacker. 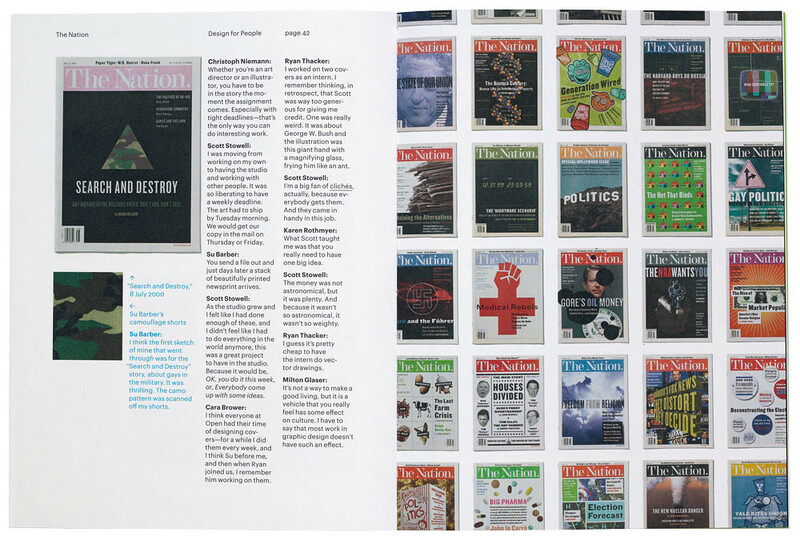 Top: Spread from Design for People showing Open’s covers for the American weekly magazine The Nation.